When the diagnosis of Ebola virus disease (EVD) is suspected, the travel and work history along with exposure to wildlife are important factors to consider. The diagnosis is confirmed by isolating the virus, detecting its RNA or proteins, or detecting antibodies against the virus in a person's blood. Isolating the virus by cell culture, detecting the viral RNA by polymerase chain reaction (PCR) and detecting proteins by enzyme-linked immunosorbent assay (ELISA) works best early and in those who have died from the disease. Detecting antibodies against the virus works best late in the disease and in those who recover. 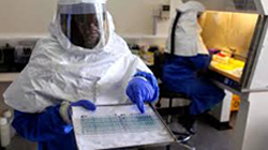 Figure 1: Diagnosis of Ebola and laboratory testing. 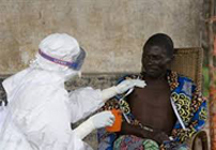 Changes on laboratory tests as a result of Ebola virus disease include a low platelet count in the blood, an initially decreased white blood cell count followed by an increase in the white blood cell count, elevated levels of the liver enzymes alanine aminotransferase (ALT) and aspartate aminotransferase (AST), and abnormalities in clotting often consistent with disseminated intravascular coagulation (DIC) such as a prolonged prothrombin time, partial thromboplastin time, and bleeding time. Early symptoms of EVD may be similar to those of other diseases common in Africa including malaria and dengue fever. The symptoms are also similar to those of Marburg virus disease and other viral hemorrhagic fevers. The complete differential diagnosis is long and includes many other infectious diseases such as typhoid fever, shigellosis, rickettsial diseases, cholera, sepsis, borreliosis, EHEC enteritis, leptospirosis, scrub typhus, plague, Q fever, candidiasis, histoplasmosis, trypanosomiasis, visceral leishmaniasis, measles, and viral hepatitis among others. Non-infectious diseases that can be confused with EVD include acute promyelocytic leukemia, hemolytic uremic syndrome, snake envenomation, clotting factor deficiencies/platelet disorders, thrombotic thrombocytopenic purpura, hereditary hemorrhagic telangiectasia, Kawasaki disease, and warfarin poisoning among others.